Tony Marshall was born in 1946 in Washington, D.C. He entered the U.S. Air Force Academy on June 4, 1964, and graduated with a commission as a 2nd Lt on June 5, 1968. Lt Marshall completed Undergraduate Navigator Training at Mather AFB, California, in May 1969, and Electronic Warfare Officer Training, also at Mather, in December 1969. After attending survival school, Radar Lead In Training, and F-4 Phantom II Combat Crew Training, he was assigned as an F-4 Weapon Systems Officer with the 46th Tactical Fighter Squadron (TFS) at MacDill AFB, Florida, from April 1970 to April 1971. He then deployed to Southeast Asia where he flew combat missions with the 13th TFS at Udorn Royal Thai AFB, Thailand, from May 1971 until he was forced to eject over North Vietnam and was taken as a Prisoner of War while flying his 269th combat mission on July 3, 1972. After spending 270 days in captivity, Capt Marshall was released during Operation Homecoming on March 29, 1973. After a brief hospitalization to recover from his captivity at Andrews AFB, Maryland, he began Undergraduate Pilot Training in January 1974. Capt Marshall was awarded his pilot wings at Williams AFB, Arizona, in April 1975, and then attended F-4 Combat Crew Training before serving as an F-4 pilot with the 92nd TFS at RAF Bentwaters, England, from March 1976 to July 1978. Maj Marshall next served as a Fighter Air Liaison Officer with the 601st Air Support Group at Frankfurt, West Germany, from July 1978 to July 1980, followed by service as an F-4 pilot with the 563rd TFS of the 37th TFW at George AFB, California, from July 1980 to July 1983. 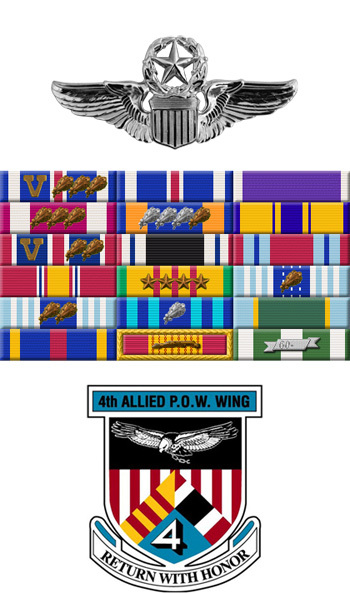 His next assignment was as an F-4G Wild Weasel Instructor Pilot and Assistant Operations Officer with the 90th TFS, and later as Chief of Operations and Training and Chief of Stan Eval with the 3rd TFW at Clark AB in the Philippines from August 1983 to August 1985. Col Marshall's final assignment was as an F-4G pilot and Assistant Operations Officer with the 563rd and then the 561st TFS at George AFB from September 1985 until his retirement from the Air Force on July 1, 1990. 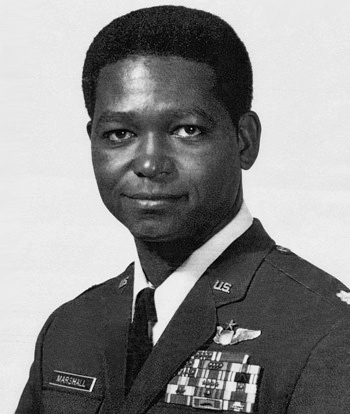 Captain Marion A. Marshall distinguished himself by heroism while participating in aerial flight as an F-4D Weapon Systems Officer while stationed at Udorn Royal Thai Air Force Base, Thailand, on 16 April 1972. On that date, Captain Marshall participated in a flight of F-4D tactical fighter-bombers on the most important attack mission in four years in the vicinity of Hanoi. Braving extremely hazardous conditions, including surface-to-air missiles, heavy antiaircraft artillery, hostile aircraft, and adverse weather, Captain Marshall courageously attacked and destroyed valuable fuel and associated equipment which was vital to hostile operations. The outstanding heroism and selfless devotion to duty displayed by Captain Marshall reflect great credit upon himself and the United States Air Force.